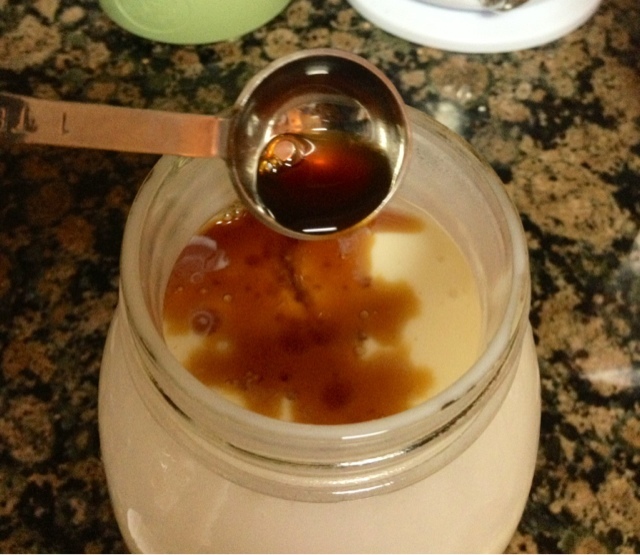 Aggies Do It Better: Make your own....Coffee Creamer! I can't even remember how I stumbled on this on the Internet. Probably browsing Pinterest.... But I saw several posts on making your own coffee cream. I'm a big coffee drinker and I do use creamer. I usually buy the standard non-dairy flavored creamers. They are filled with all kinds of questionable crap, but like most of us I just do the ol' cover-my-ears-and-sing-LALALALALAAA. The recipes suggest using a mixture of sweetened condensed milk (which is FABULOUS In coffee by itself) and milk. I'm not exactly "dairy free", but I tend to not tolerate milk that well (hence the creamer). So I made this with coconut milk, although if you want to just use the same amount of regular milk. I did choose the sweetened coconut milk, which has cane sugar already in it and some other stuff. 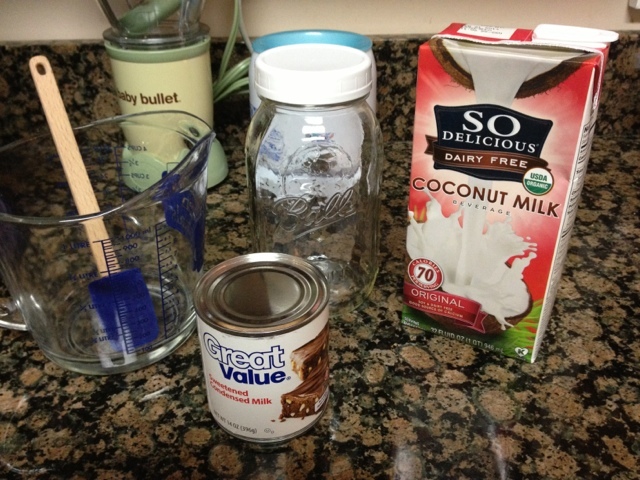 Into a large measuring cup (or right into your storage container, you could reuse your creamer bottle. 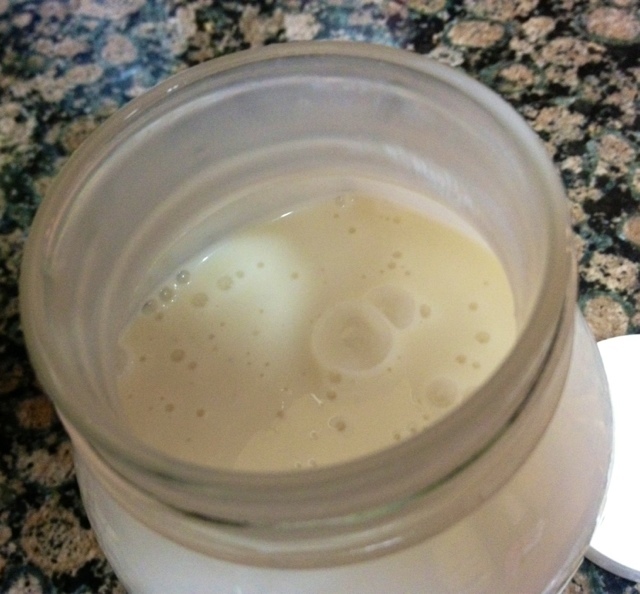 I used a quart size ball jar) pour out 2 cups milk. 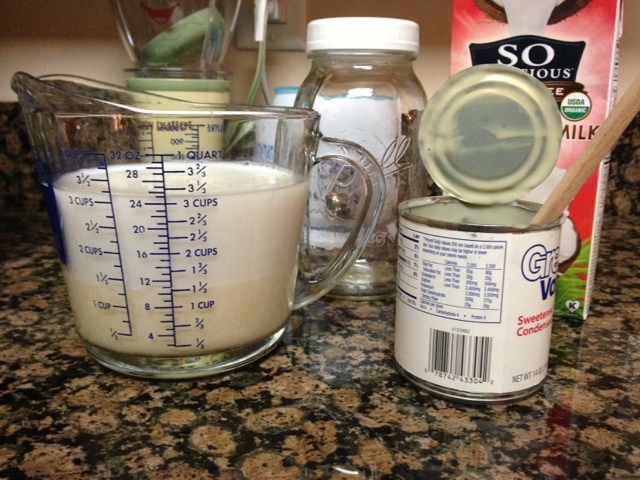 Add one small can sweetened condensed milk. For vanilla flavor, I added 1 teaspoon of vanilla extract. You could add whatever you want! Almond would be good too. Then Shake! (I found shaking worked better than stirring). That's it!!!! Y'all. This is so good. It tastes like cremé brûlée. Or custard. I dare you to not sneak a taste....just remember, the point of making this is for it to go in your COFFEE, not your MOUTH. Can you imagine just eating (drinking?) coffee-mate straight? Ew. Next I am going to try making my own coconut sweetened condensed milk first then add the milk so it will be a completely dairy free option. As well as closer to a "Real Food". Nutrition info: I compared this to what I usually use...homemade is 60 calories per ounce, compared to 70 on the store bought. Yay for that! Plus you know EXACTLY what's in it. Cost wise, it's pretty much the same. I got this coconut milk at WM, back in the section by the cokes/beer. They have it for the lowest price, but only this kind and the unsweetened kind. So not a wide variety, but good for them for carrying it.